Yesterday I bought these adorable sandals from Coach – surprising right? I don’t always love their things, but they really got it right with their line of shoes for fall. I also love this pair of cognac + black pumps. Perfect for work-to-weekend wear! I’ve added some new steps to my evening skincare regimen – now instead of just taking off my makeup, I’m also putting on Dr. Jart’s V7 Renewal Serum followed by the Premium Firming Sleeping Mask. I’ve been particularly enjoying the mask – it absorbs into your skin immediately (no yucky film and it’s clear!) and keeps my face and neck hydrated all night long while enhancing cell turnover and firming my skin. When I wake up to shower, I just wash it off. Magic! With my workout schedule perfected with Flywheel, I’m now totally focused on eating better. I’ve been researching Pinterest for some healthy and delicious recipes and I’ve found a few front runners for fall: this Autumn Cobb salad with peaches, pecans, apples and tomatoes sounds amazing! Another that would make a great take-it-to-work meal is this chickpea and tomato salad. Yum! For more great recipe ideas, click here! I love that TopShop skirt–and the price can’t be beat! Love you picks as always! I am loving that green satin wrap! What an amazing color, and you can’t beat that price! Great picks. Just finished the cuckoos calling!! Definitely an interesting book. 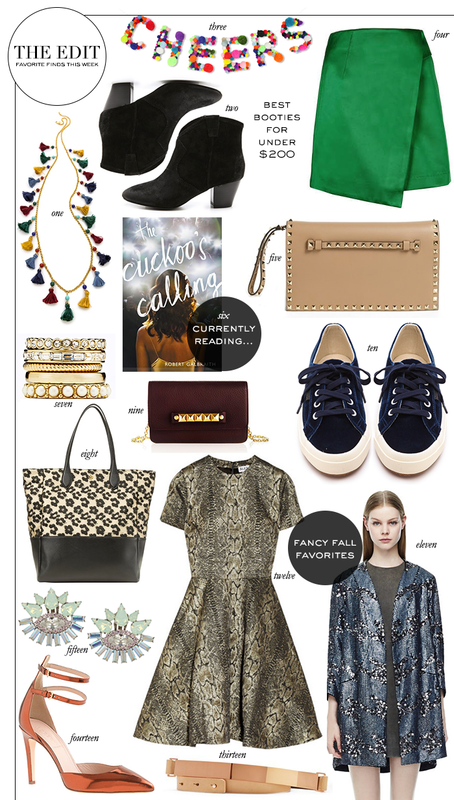 That green skirt is everything and love that oxblood clutch. Merritt, I love “The Edit”. You have great taste. I could really use 1,7,9,12 +13 in my closet. Ok. I can tell this blog is not going to be good for my wallet. I love your style and all these picks are amazing! that necklace is so me! and that green skirt! I can’t even imagine my life without. That Theory jacket….so good! Amazing round-up! Love these picks, especially that snakeskin printed dress! We tend to stick to neutrals but that emerald green skirt is amazing. Might have to break the rules on this one.